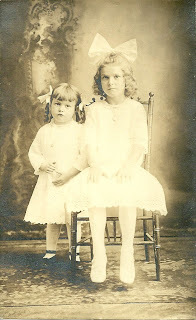 Real Photo Postcard of Dorothy and Alice Henward, daughters of James and Carrie (Lee) Henward of Eastport, Maine. This is the second photograph of Alice Henward I've found. To see the first, here's a link to an earlier post on Alice Henward. Dorothy was born about 1909, and Alice about 1914. Alice married Donald L. Curtis in 1939. James Henward was the son of Horace Henward, born in Nova Scotia and his wife Seminah. The Henward name appears in several variations: Hennard, Henwood, etc. I haven't yet found out the parents of Carrie M. Lee. If you have any corrections, additions or insights regarding the information presented above, please scroll down to the comments box or contact me directly. Thanks for stopping by!